Public services, financing, and implementation. EMC Planning Group analyzed and prepared land use and urban design policies to be consistent with local jurisdiction planning documents. 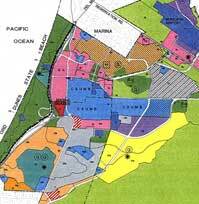 EMC Planning Group wrote a local jurisdiction/reuse agency process, CEQA compliance documents, and shepherded the plan to its approval by the Fort Ord Reuse Authority.